Provide guidance on the process and criteria for the assessment of public art and the re-siting or removal of public art. Ensure public art is maintained to an appropriate standard. Council has acquired art in public spaces for many years through gifts from the community and artists, Council projects and competitions. These art works are sited on public land or the exterior of Council buildings with Council agreement. Many of the works are by local artists and include sculptures and a mural. At least one private commercial building has a significant art work on the exterior wall occupying public air space. Public art has been acquired on a case by case basis with no formal policy or criteria for assessment in most cases. Several sculptures have been acquired as a result of competitions. A commitment has been made by Council to maintain the existing public art to an appropriate standard. Adding more public art helps maintain an interesting and vibrant community. Significant items can become a talking point or tourist attraction. 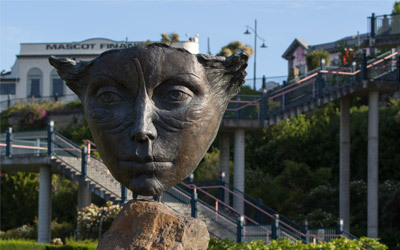 Public Art includes all art forms that are located in a public space owned or administered by Council. It includes permanent public art, temporary public art and the contribution of an artist(s) to the design of public spaces. Temporary Public Art – public art that will be in place for less than three months. Public Art does not include existing memorials, historic objects, privately owned works (unless temporarily in a public space) or anything on private land, art within Council buildings, the Aigantighe Art Gallery collection, the South Canterbury Museum collection, advertising, billboards or information signage, graffiti, vandalism or other works where the primary purpose is not to develop a piece of art. Public Space means a space excluding a building or facility, under the control of Council that at any time is open to or is being used by the public, whether free or for payment of a charge and includes every road, street, footpath, court alley, pedestrian mall, cycle track, lane, access way, thoroughfare, reserve, park, domain, beach, foreshore and any other place of public access or recreation. Offensive Public Art is art that does not meet “commonly held standards of decency” and includes explicit sexual material, material inciting or encouraging violence, features swear-words, contains slanderous content, material encouraging or inciting illegal activity, material encouraging or inciting discrimination of any sort. Anyone wishing to develop or donate public art to Council for permanent display in a public space must apply in writing specifying how the criteria for acceptance in 4.3 will be met. If the public art work is significant it is referred to the Public Art Advisory Group to assess against the criteria outlined in 4.3 of this policy. This assessment will then be recommended to the Community Development Committee for a final decision. If the public art is not significant, the unit responsible for the management of the public space, Council’s Art Gallery Manager and the Group Manager responsible for the particular area of public space will assess it against the criterial in 4.3 of this policy. Public art should enliven the space, entertain, challenge, be thought provoking or educate the public. While art works may be the subject of debate as to artistic merits, it is important that the public art is of a sufficiently high standard to be displayed in a public space. Public art should be suitable for the site and consider the physical character, topography, history and purpose of the public space. The art work should not impede public use of the relevant public space(s). Public art should capture the public’s imagination and help create a sense of place or identity. It should creatively enhance the unique experience of living and working here. Art works should not be objectionable but should reflect our diversity and add vibrancy to the space. Public art must be robust, easy to maintain and of good quality material. The proposed work will take into account environmental conditions of public display, materials to be used, the intended lifespan of the works as well as ongoing maintenance costs. Public art must satisfy health and safety requirements. For example, sharp edges or points that protrude or incorporating asbestos or other known dangerous elements are not acceptable. Public art shall comply with the requirements of any legislation, regulations and statutory plans including the Timaru District Plan and the Building Act 2004 as applicable. Council will appoint a Public Art Advisory Group to assess public art work proposals against the criteria for acceptance in 4.3 and relocation and removal in 4.6 of this policy. The group will comprise up to 7 members including the Council manager responsible for the site, another with expertise in arts, with another Council staff member with knowledge of maintenance, health and safety or another relevant discipline if required. Up to four members of the community with a background in arts, architecture, landscape architecture, tangata whenua, or urban design will complete the membership of the group. The Council acknowledges Ngai Tahu iwi and particularly Arowhenua Runanga as tangata whenua (the people of Timaru District). Any artists presenting work referencing Maori must demonstrate consultation with tangata whenua. The consultation will include the protocols involved with the installation and unveiling. The group will meet on an as required basis and is not a formally constituted committee of Council and there will be no Councillor membership on the group. Members of the group will not be remunerated. The Public Art Advisory Group will recommend to the relevant Community Board when the proposed art work is within the Temuka, Pleasant Point or Geraldine Ward. Council will retain ownership and be responsible for the maintenance of all permanent public art unless specified otherwise in a contract or the public art work is removed. Council will adopt the role of guardian of the art work. The artist(s) will retain copyright of the work. However, the artist(s) must agree to let Council use the public art work image in any way. Permanent public art work will be maintained to acceptable standards including regular inspection, management and the conservation treatment to mitigate deterioration of the individual public art works. Significant and/or substantial changes in the pattern of use, community, character or design of the environment where the public art work is located necessitates a re-evaluation of the relationship of the public art work to the site. The public art work site or part of the site is to be redeveloped, demolished or sold and it is not possible to incorporate the public art work into the redevelopment without compromising the integrity of the public art work or incurring excessive costs. A new or better site has become available for an artwork. The public art work requires a high level of maintenance and/or conservation rendering excessive asset management expenses. The public art work endangers public health and safety, and remedy is impractical or will undermine the integrity of the public art work. Council is unable to reasonably guarantee the condition or security of the public art work in its present location or the public art work is irreparably damaged, due to reasons beyond the control of the council. Council is no longer able to meet the terms of acquisition, or the terms contain in any agreement governing the Council’s lease or purchase of the public art work. Recommendations for the relocation or removal of works will be made to, and must be approved by, Council. Advice will be sought from the Public Art Advisory Group where appropriate. Where possible, the artist(s) and/or donor(s) of works recommended for relocation or removal will be consulted. All money realised from the sale of works will be used to fund further public art works.